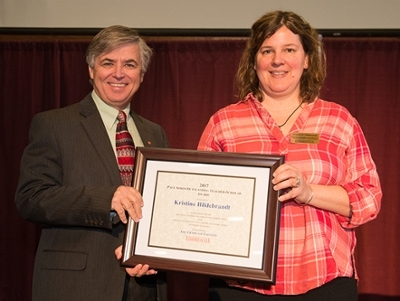 Southern Illinois University Edwardsville’s Kristine Hildebrandt, PhD, professor in the College of Arts and Sciences’ Department of English Language and Literature, was presented the 2017 Paul Simon Outstanding Teacher-Scholar Award at the Paul Simon luncheon held Tuesday, March 21, during the 21st Annual Graduate School Spring Research Symposium. The award demonstrates the belief that to be a good teacher, one must also be a good scholar. Named in honor of famed Illinois politician Paul Simon, it recognizes significant achievements in research, and the integration of that research into teaching and mentoring. Since beginning her tenure at SIUE in 2008, Hildebrandt’s grant activities have resulted in more than $497,000 in externally funded grants and $51,000 in internal grants. She received SIUE’s first National Science Foundation (NSF) CAREER Award, which is both highly competitive and prestigious. Hildebrandt is currently leading two NSF sponsored collaborative research teams. In addition to an extensive list of publications, conference presentations and research projects, Hildebrandt co-founded and co-directs the Interdisciplinary Research and Informatics Scholarship (IRIS) Center. Since its launch in 2010, she had mentored through the Center more than 12 undergraduates and six graduate students. During the recognition luncheon, 2016 Paul Simon Teacher-Scholar awardee Cristina De Meo, PhD, professor in the Department of Chemistry, was the featured speaker. She emphasized her strong commitment to the teacher-scholar philosophy and the power of collaboration. The day-long Spring Research Symposium celebrates and showcases the variety of research and creative activities taking place at SIUE. The Symposium also included a speed networking event on the topic of population health, development and wellness research. Additionally, graduate student researchers presented posters and creative exhibits displaying their scholarly activities. A scholarly activity SLAM offered an opportunity for graduate and professional students to present their research in an upbeat and engaging format. Psychology master’s candidate Melissa Beyer earned first place in the competition for her presentation on the language of sexual assault and the therapeutic relationship. Second place went to Anahid Omran, who is pursuing a master’s in chemistry. Molly McCready, a student in the environmental sciences graduate program, achieved the people’s choice award. The day’s events ended with a special reception hosted by SIUE Chancellor Randy Pembrook honoring faculty and staff who submitted external grants and recognizing first time principal investigators. Photo: SIUE Chancellor Randy Pembrook presents the 2017 Paul Simon Teacher-Scholar Award to Dr. Kristine Hildebrandt, professor in the College of Arts and Sciences’ Department of English Language and Literature. 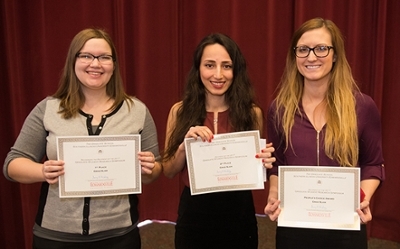 Winners of the scholarly activity SLAM were (L-R) Melissa Beyer (first place), Anahid Omran (second place), and Molly McCready (people’s choice).